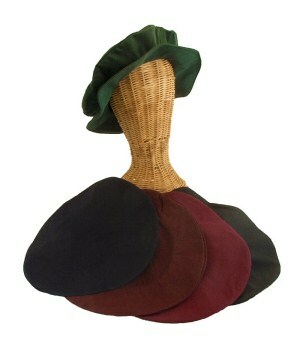 In addition to being a stylish and authentic addition to your Ren-Faire look, this cotton twill cap serves a very practical purpose: the flat, interlined brim makes a great sunshade for your face on those hot summer days! Choose from Hunter Green, Black, Brown, Burgundy and Navy, sizes Large and X-Large. Please see size info below before ordering. To order, choose your size and color from the dropdown lists below, then click 'add to cart'. NOTE: This is a fitted garment. It is important that you take measurements and check the size chart before ordering, to avoid getting a garment that does not fit, and not having it to wear for your important event. Please don't rely on size tags from other garments or others you have purchased in the past.